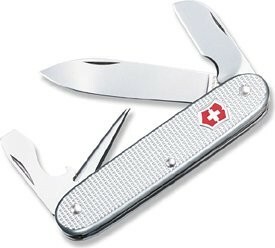 While the Silver Alox versions of Victorinox Swiss Army knives do have advantages compared to the classic red polymer and stainless steel builds, the Swiss Army Electrician manages to make a good pocket knife fall short of its name. In the Swiss Army Electrician, you'll find several handy tools. The Silver Alox design eliminates some of the bulk of the company's multi-blade knives by combining handle slab and liner. Brass bushings compensate for the loss of the usual stainless steel liners, and the result is a slimline version of the bulkier classic build. With a folded length of 3-1/2 inches, the Electrician is a convenient size for the pocket and wields a stout main spear point blade of high carbon stainless steel. Other options include an electrician's blade with wire scraper notch, bottle opener blade with wire stripper notch and flat head screwdriver tip, and a reamer. Professional electricians will recognize the shortcomings. Special tools are required to do high quality electrical work, and a pocket knife doesn't measure up to that standard. The Electrician provides a few useful options for emergency work which a standard pocket knife does not, but the array of stainless steel blades won't be first line choices for the tradesman. Everybody needs a pocket knife, though, and whether you work in residential construction or work for the power company, the Electrician will serve well in those important but ordinary situations. Now and then, the simple tools it provides could construct a temporary solution to more technical wiring challenges. Just remember to go back later and do it right. For a more versatile multi-tool from Victorinox, see the SwissTool X.